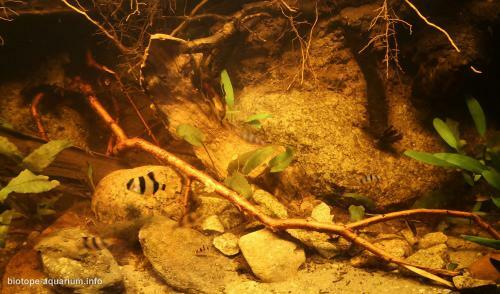 Description of decorations: Well watered driftwood covers the substrate, which is a mixture of sand, clay and fine gravel. Mix of peat, leaves, bark and small branches lays in the parts of tank with small current. Description of equipment: AQUAEL ASAP 750E external filter, AQUAEL FZN-2. Lighting: light color 10000k, warm color 3000k. Water parameters: Temperature 25 degrees celsius. KH 4, GH 4, pH 6, conductivity 50 µS/cm. Description of the area surrounding the biotope: The Kapuas River of Borneo is Indonesia’s largest river system. Measuring 1,143 kilometres, it is also the world’s longest island river. Borneo, often referred to as the ‘Asian Amazon’. It flows through marshy region rich in tropical forests, nearly parallel to the Barito River, and merges with the latter about 60 km from the Java Sea coast. The Kapuas River is narrow (about 50 m) and very winding in its upper stream. It straightens and widens up to 450 m in its lower reaches. There, it contains several elongated islands (shorter than 2 km). The total area of 98,740 km2 (38,100 m2), the basin covers over 67% of Western Kalimantan. The climate is warm and very humid, he temperature is rather stable with a typical minimum of 24°C and maximum of 32°C. There are two national parks on the river banks, Betung Kerihun with an area of 8,000 km2 and Danau Sentarum (area 1,320 km2), the latter includes the Kapuas Lakes. About 300 species of fish have been identified in the river basin. Part of the high species diversity in the Kapuas is related to the many different habitats in the river basin. 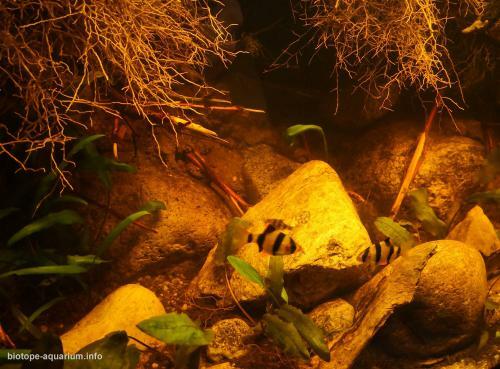 In the headwaters are fast-flowing highland streams, typically dominated by small loaches, and small – often acidic (blackwater) — forest streams and peat swampswith species such as the tiny Sundadanio rasboras and macropodusine gouramis. The main river it self also includes several habitats, ranging from the nearshore to open waters. 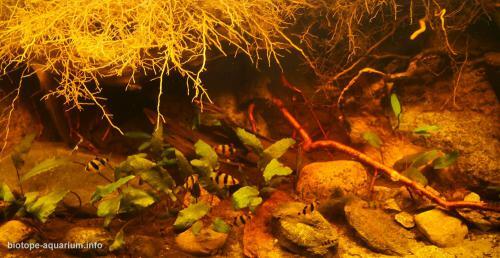 Description of the underwater landscape of the biotope: In the natural environment, the water is very soft, sour and tinted with tea thanks to tannins. Tannins are in the water due to the large amount of roots lying on the bottom and fallen leaves. The light reaching the bottom is very weak, scattered due to the large number of trees growing on the banks of the river. Sandy bottom, with stones, covered with a thick layer of detritus. Description of the parameters of the habitat: Water at about 27 degrees, very soft, conductivity 40 μS / cm. High tannin content. PH 5.5. List of fishes and invertebrates occurring in the nature biotope: About 300 species of fish from families have been identified in the river basin, for example: Cyprinidae – Sundadanio axelrodi, Pangasiidae – Pangasius macronema, Cobitidae – Pangio shelfordii, Belonidae – Xenentodon canciloides, Osphronemidae – Sphaerichthys vaillanti. List of plants found in the nature biotope: In such water parameters few plant species as Microsorum sp. 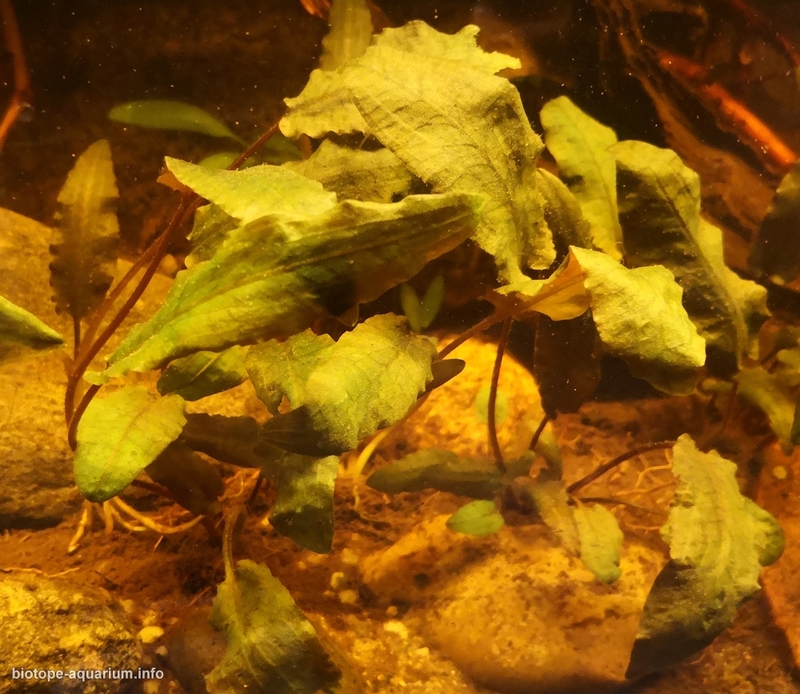 or Cryptocoryne sp. can grow. 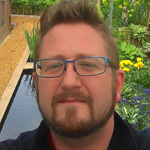 Threats to the ecology: The main threat to the entire region is the legal and illegal cutting of trees, which leads to huge changes in the ecosystem. The extraction of gold and other natural resources also has a huge negative impact on the natural environment. Extraction in streams of streams and rivers increases the amount of suspended matter in the water, which affects life in them. Fortunately, in the Kapuas basin there are two national parks Danau Sentarum and Betung Kerihun, which is why there is a chance for at least partial conservation of the environment in an unchanged state. Interesting tank to observe. This would have been ideal for these fishes, but not fort he Chromobotia macracanthus. I did not notice them in the pictures, but if they are inhabitants of this aquarium (which at the most has a usefull volume of 250 liters, this is too small for them.